(NewsUSA) - Until this summer, Matt Berna had an unusual tradition: Every year, he moved to a new apartment. After doing this for 9 years, the 27-year-old inside sales professional decided enough was enough. "Yeah, I've been moving since I was 18," says Matt, "and I was getting sick of it. I'm really good at packing and moving, though. I've had lots of practice." Part of the reason Matt moved so frequently was that he enjoyed getting to know different areas of Milwaukee, Wisconsin. It also taught him which neighborhoods he'd want to live in on a more permanent basis. "After working in the mortgage industry for three years, I became very aware of what a smart financial decision it is to buy a home," explains Matt. So, he began house hunting while living with a roommate and paying $525 each for rent. Because Matt owns a motorcycle, a house with a garage was a must. Unfortunately, the area he wanted was comprised of older homes - many without garages. And, he was unwilling to go above his price range. As a young first-time homebuyer with student loan debt, Matt didn't want to overextend himself. He also didn't have enough in his savings for a 20 percent down payment. So, when he finally found his four-bedroom home with a garage, and in his price range, he decided to apply for a low-down-payment loan. His goal was to put down five percent and use private mortgage insurance, which is required on conventional loans with less than a 20 percent down payment. Yet Matt was still a bit uncomfortable about using all of his savings for his down payment and closing costs. He had the money, but wondered what would happen if his bike or new home needed expensive repairs. Matt wanted to ensure that he still had a rainy-day fund just in case, so he researched down payment assistance programs. While there are different types of programs available, Matt took advantage of the Easy Close Advantage - Down Payment Assistance program offered through WHEDA (Wisconsin Housing and Economic Development Authority). In order to be eligible, buyers must be purchasing an owner-occupied home in Wisconsin and meet specific requirements, such as income levels, credit ratings and home-purchase price limits. Matt easily qualified for the program, and closed on his home in July 2018. His monthly mortgage payment is $1,292, which includes escrow and $59 for the down-payment-assistance loan. But what does a smart millennial do with a big four-bedroom house and a lot of former roommates? Yep. Even though Matt could afford the mortgage himself, he invited two of his buddies to live with him. Now, his roomies pay $550 each per month and Matt pays only $192 of the mortgage, so he's saving money while building equity. As Matt confides, "I see this house as a really good investment." And on top of that, he can finally get rid of his moving boxes! 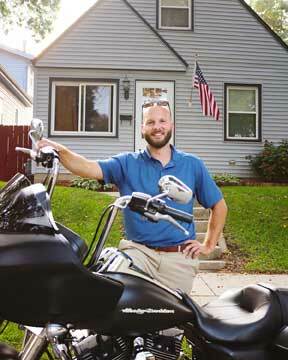 After finding the right home for himself and his motorcycle, first-time homebuyer Matt Berna utilized a down payment assistance program for his down payment, keeping his savings intact for a rainy day.